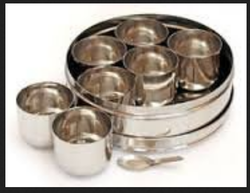 - This Stainless Steel Masala Dabba (Spice Storage Box) is a traditional container that can be found in most Indian homes to store and provide easy access to most commonly used spices. We offer Plastic Masala Box to our clients. Indian kitchen organization ideas how i store dry spices? tupperware spice containers. Tupperware Glass-eleganzia., Size: 250ml/per Glass. Featue: Separate seven removable cups for storing herbs and spices. Easy to hold, pick up and carry. Bright and colorful, the Spice Box is aesthetically designed to store all your essential cooking spices. It consists of seven separate removable cups and a small utility spoon for convenient handling and ease of use. Spicy new way to store your spices. Virtually airtight seal to lock in the freshness of spicesand handy size for easy gripping. 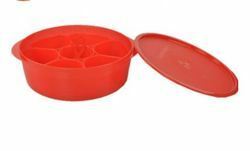 We are engaged in offering Tupperware Spice Box. Use this handy Multi-masala from Tupperware to store all the daily masala's that you use in your kitchen. Bright and colourful, the Multi Masala is aesthetically designed to store all your essential cooking spices. It consists of seven separate removable cups and a small utility spoon for convenient handling and ease of use. Our reputed entity is engaged in supplying Spice It Masala Box.